Rapeeporn (May) Srithanes is an analyst in the BGA Thailand office. 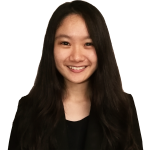 Her role is to research and monitor government policies, regulatory developments and relevant stakeholders in Thailand for clients. May has experience understanding the connection between government policy and the corporate world. Prior to joining BGA, she worked for General Electric (GE) as a government affairs and policy fellow based in Bangkok. She supported the government affairs director’s engagement with a wide range of GE businesses and key government stakeholders. She also worked with the other ASEAN government affairs fellows to develop a report that identified the Asia-Pacific market’s potential for renewable energy and defined the key regulatory challenges that the industry is facing. Before joining GE, May worked for a non-governmental organization called the Association of Asian Confederation of Credit Unions, which promotes the principle of financial inclusion and sustainable development across Asia. She was responsible for corporate communication and key member-activity engagement. May received her bachelor’s degree in political science with a minor in biology from the University of Kentucky in 2014. After graduation, she joined the Borgen Project as a political affairs intern advocating for making global poverty a key political priority while also working as a laboratory assistant at the Graduate Center for Toxicology at the University of Kentucky.